Today would have been John Lennon’s 70th birthday. John Lennon was murdered thirty years ago this December in NYC. I was six months old. It was certainly the biggest tragedy of my young life. Maybe of my whole life. He was a visionary, a musical genius, a soulful superstar. I was accepted into the prestigious creative advertising program at UT because of John Lennon, in a way. (I used some of the “Imagine” lyrics in the graphic art project I created to apply for the program.) Of course, I became a copywriter instead of a graphic designer. John’s music — from the early Beatles to Let It Be to his solo career — is timelessly wonderful and creative. I recently read this fascinating series of articles about Lennon’s collaboration with Paul McCartney on Slate Magazine. I find it beautifully touching how much John Lennon has meant to me and my generation, and of course our parents’ generation and others. His peaceful, poetic message lives on through his amazing music. 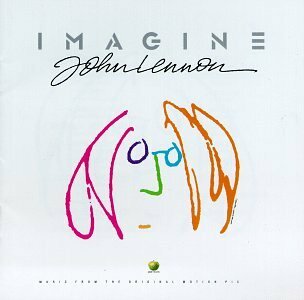 “Imagine” is probably my favorite song of all time. I want it played when I die. I’ve been thinking a lot about thinking lately. Can we be mindful and still imagine? Can we wander with wonder, without so much emphasis on attachment? Can we be busy making plans and then let life happen? Is love all we need? I personally tend to imagine naturally. And sometimes daydream or fantasize or ruminate. Imagination is a powerful thing. Its power can be harnessed for good or evil. My current practice, the practice of a lifetime, is to balance imagination with practical reality. To balance heart and head. Find the harmony in body, mind and soul. Thanks, John, for reminding me to imagine. Imagine if there were no naive people thinking that the world will live as one. Lennon’s humanism may have had noble intensions, but it is humanism, not religion which is really the greatest evil in the world. Lennon’s humanism wages war against the God of creation. Private property is a good concept. People are not meant to share everything. Why should I work harder if the slob next door gets the same reward I do? Lennon’s communistic utopia will never happen because evil resides in the hearts of people. Evil manifests itself through wicked and “basically good” people. Until the Redeemer returns and restores Creation to its perfect form, the world will never live as one. Thanks for this thought-provoking comment. You are the slob next door. You are everyone and no one. You are you. But don’t identity solely with your ego. We all have hearts, lungs and souls — whether we “believe” in the God of creation or not. The label “communistic utopia” is misled. Communism and socialism haven’t worked in the past. That doesn’t mean oneness is an impossibility. Your first reply was really quite juvenile and absurd. It is an ad hominem fallacy. In other words, you can’t address the substance of my argument so you attack me. “You are everyone and no one. You are you” is really ridiculous, nonsensical and without meaning. You quote the Dalai Lama that people love truth, justice, peace and liberty, but you would impose utopia on everyone for their own good. Utopia is only possible if people willing choose it. We live in a sinful, fallen world where people are evil. Evil people will always take advantage of the good will of others. Just look at the lazy mob who force producers to hand them welfare checks. Because people are evil and not “basically good” utopia is impossible until the Prince of Peace returns and restores his Creation. Hey DogTags, have you read Utopia? Or were we to suppose that the lyrical stylings of John Lennon were sufficient in describing this (very short) book which brought life to the concept of Utopia? It actually addressed little on the concepts of good and evil, but more clearly identified the absurdity of the value system that is created by capitalist societies. As far as potential for a “Utopia” goes, it is not for you to declare it’s impossibility. It makes me sad for you that you are in a such state of “dis-ease” that causes you to shed a blind eye on the NEXT neighbor over who does, in fact, bring meals to those who cannot get for themselves, spends time visiting people in the hospital, shares a smile with anyone who will accept it and generally has light in his/her heart most days. Making a claim such as your “Because people are evil…”(this is an ALL statement, which almost by definition makes it false – learn your Deductive Systems!) speaks more about what is inside you than it does about others. I’m sure there are lots of bloggers who welcome this type of discourse, but you’re comments are not suited to many of the avid Yoga Freedom readers. It is possible that I am one of a small few who has not yet attained the self control to simply ignore you. Many people find a great deal of comfort from the thought provoking, mindful and serene passages that are provided for us (for free!!) by this ever so generous and FAR from evil host. Perhaps if you looked for more people who were NOT evil AND basically good, you could find your own personal Utopia and then apologize to Yoga Freedom for making a silly first impression. DogTags, your argument is simply a regurgitation of the conditioning you have received from your church/upbringing/the media/whatever. By saying you are everyone and no one I am simply pointing out the fact that we humans are all fundamentally the same, whether we as a race are “fallen” or not. There will be no harmony as long as there is greed. Waiting for some future perfect moment when Jesus Christ will return and rapture you to heaven is insane. Typical anti-intellectual response: “I can’t respond substantively to your argument so I’ll just say you can’t think for yourself and you are parrot what someone told you.” This is ironic coming from naive people who continue to recite Lennon’s inane, secular humanistic lyrics. Talk about regurgitation! The value system created by “utopia” wages war against the Absolute Truth established by God. You will never have peace and harmony until you acknowledge the Lordship of Jesus Christ. Heaven is big enough for all of us. I don’t want anyone to be damned. (It is really is presumptuous of you to project your own misconceptions on me.) Jesus is waiting for you to accept him. Only then you will have peace. Capitalism created vaccines, over abundance of food, medical advances, prosperity across ethnic, geographical, class lines. Capitalism has done more to reduce poverty than anyone’s simple, inane, banal lyrics. For the record, I am not talking about a neighbor truly in need. I am talking about a lazy rabble who benefit from the forced charity of others and then use that to buy X-Boxes, booze, smokes, drugs, or gambles with it. That is the result of government programs. Forced charity results in a lazy rabble because a government program is too inefficient and fraught with too much liability to hold laziness in check. For the record, government programs tend to fail because there ARE people who take advantage of resources without serious need for them. There ARE people who take Paratransit who are not disabled, and when precautions are taken to avoid having those people participate, those who actually ARE in need feel so scrutinized that embarrassment trumps need and they opt out of the service. It’s true that there need to be better needs assessments done – DogTags, do you have any suggestions? At this point in my personal spiritual path, I don’t find it necessary or helpful to believe or disbelieve in God. It’s unknowable. What matters is living in the present with compassion. Jesus is God as much as every living being is God. Most of us are not a whole lot like Jesus though. We are SINNERS. Know what Jesus WOULDN’T do? Judge and exploit people like some “Christians” do today. Or write nasty comments on a lovely blog post about John Lennon. That my comments make you feel guilty or ashamed of your faith in nothingness does not mean my comments are nasty. In fact, because I believe Jesus said “I am the Way, the Truth and the Life. No one comes to the Father except through me” it is compassionate for me to tell you the Truth. My goal is not to make a few points on a blog and tick people off. My aim is only for the glory of God, that his name is glorified in all the earth and that you might have the opportunity to have a relationship with Jesus too, because yoga does not truly give you freedom. Only Jesus can give you freedom to live and love. Jesus frees you from your sin so you no longer have to call yourself a sinner. Thanks for trying, then. Clearly, you’re barking up the wrong tree. I am a Christian; however, I am a much different sort of Christian than Dogtags, and I am saddened at the way that he and so many others present Christ and push THEIR agenda. 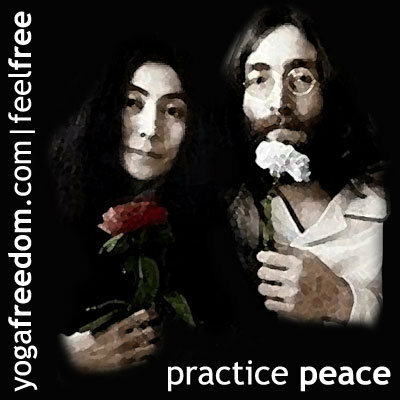 Actually, Yoga and Christianty have a lot in common to those who truly have the spirit of love and compassion in their hearts. Don’t judge all by one hardhearted Christian, we’re not all like that. b) we are all sinners who are not ‘believers’ in *your* concept of God. c) your arrogance knows almost no bounds – you think you can ‘save’ us! Thanks for exposing yourself as a bigoted, prejudiced, ignorant fool. Carry on with your blinkered life, I have nothing left to say to you. It seems to me that the one who cannot think for himself is dogtag! You have had the religion of your parents shoved down your throat so long you aren’t thinking for yourself!